S0729. 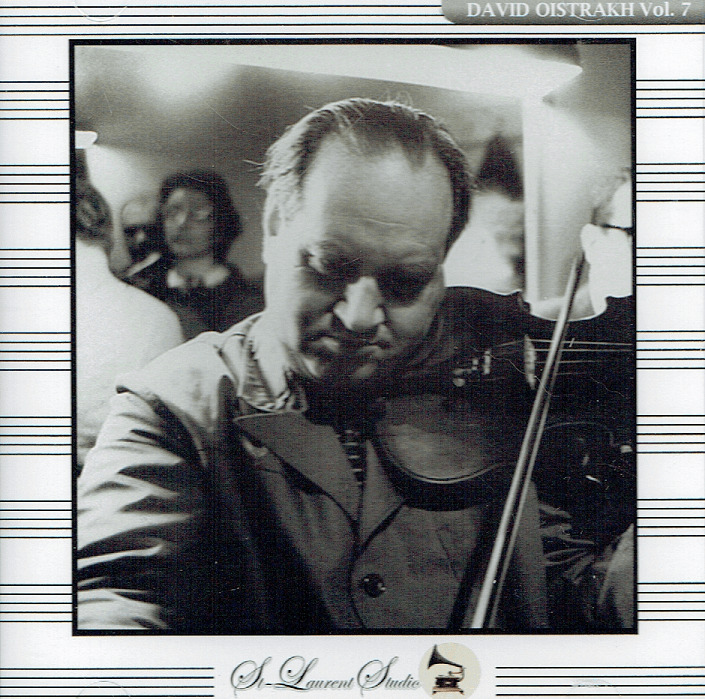 DAVID OISTRAKH, w. Vladimir Yampolsky (Pf. ): Violin Concerto in a (Bach); Violin Concerto #1 in g (Bruch); Poeme for Violin & Orch. 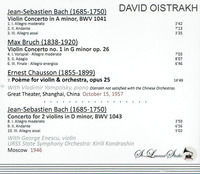 (Chausson), Live Performance, 15 Oct., 1957, Shanghai [Oistrakh is accompanied by Yampolsky since he was not satisfied with Chinese orchestras]; DAVID OISTRAKH & GEORGES ENESCU, w. Kondrashin Cond. USSR State S. O.: Violin Concerto for Two Violins in d (Bach), recorded 1946. (Canada) St Laurent Studio YSL T-722. Transfers by Yves St Laurent. 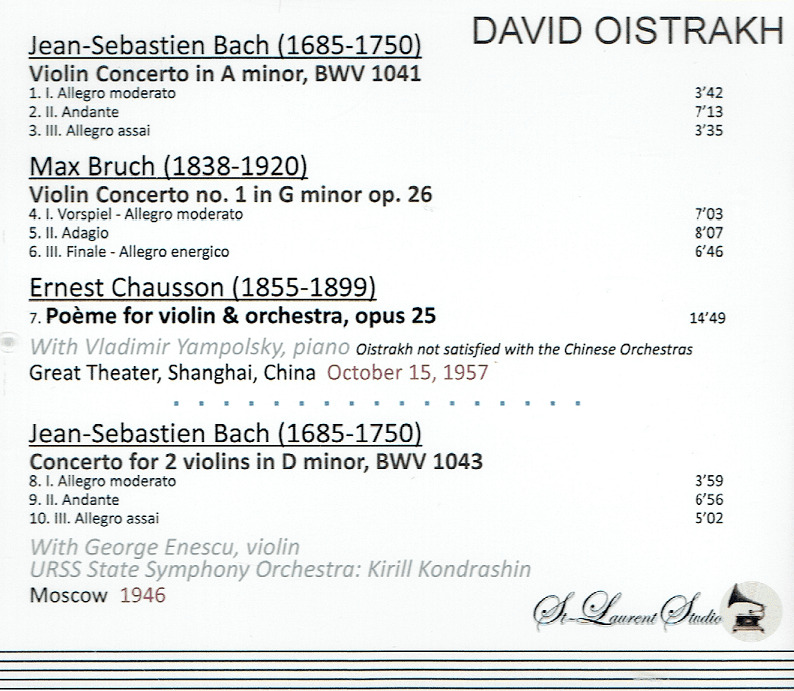 "David Oistrakh is considered the premiere violinist of the mid-twentieth century from the Soviet Union. His recorded legacy includes nearly the entire standard violin repertory up to and including Prokofiev and Bartok. In 1937 the Soviet government sent him to Brussels to compete in the International Ysaye Competition, where he took home first prize. With his victory in Brussels, Soviet composers began to take notice of their young compatriot, enabling Oistrakh to work closely with Miaskovsky and Khachaturian on their concerti in 1939 and 1940, respectively. In addition, his close friendship with Shostakovich led the composer to write two concerti for the instrument (the first of which Oistrakh played at his, and its, triumphant American premiere in 1955). During the 1940s Oistrakh's active performing schedule took him across the Soviet Union but his international career had to wait until the 1950s, when the political climate had cooled enough for Soviet artists to be welcomed in the capitals of the West. Throughout his career David Oistrakh was known for his honest, warm personality; he developed close friendships with many of the leading musicians of the day. His violin technique was virtually flawless, though he never allowed purely physical matters to dominate his musical performances. He always demanded of himself (and his students) that musical proficiency, intelligence, and emotion be in balance, regardless of the particular style. Oistrakh felt that a violinist's essence was communicated through clever and subtle use of the bow, and not through overly expressive use of vibrato. To this end he developed a remarkably relaxed, flexible right arm technique, capable of producing the most delicate expressive nuances, but equally capable of generating great volume and projection." “George Enescu is still considered the greatest of all Romanian composers. While he is widely known for just one famous opus, he was in reality a very imaginative, highly skilled composer of music possessing great depth and subtlety, as well as being one of the great concert violinists of his time. For appearances in the West he adapted his name to a form that would prompt the French to pronounce it correctly: Georges Enesco. He was given a violin and lessons at the age of four, progressing very rapidly and beginning to compose a year later. Legend has it his first teacher was a Romany fiddler. He entered the conservatory of the Gesellschaft der Musikfreunde in Vienna in 1888 where his primary violin teacher was Joseph Hellmesberger, Sr., one of his teachers and the director of the Vienna Conservatory, who hosted Enescu at his home, a place where the child prodigy met his idol, Johannes Brahms. He took piano from Ernst Ludwig and harmony, theory, and composition from Robert Fuchs. He made his violin début in 1889 in Slanic, Moravia. He remained in the Conservatory until 1894, regarded as a fully formed virtuoso at the age of 13. On 6 February 1898, at the age of only 16, George Enescu presented in Paris his first mature work, ‘Poema Română’, played by the Colonne Orchestra (at the time, one of the most prestigious in the world) and conducted by Édouard Colonne. Nevertheless, he went on to the Paris Conservatory for more violin studies, and took harmony, theory, and composition from Dubois, Gédalge, Massenet, and Fauré. This mixture of late Romantic German and French training helped give his music its distinctive quality. That same year he started conducting the Romanian Philharmonic Society in Bucharest. Enescu quickly established one of the most important solo and chamber music careers of the time. His recital partner was the great French pianist Alfred Cortot, and he formed a piano trio with Louis Fournier and Alfredo Casella in 1902, and in 1904 the Enescu Quartet. He joined the faculties of the École Normal and the American Conservatory in Paris. Pablo Casals described Enescu as ‘the greatest musical phenomenon since Mozart’ and ‘one of the greatest geniuses of modern music’. Vincent d'Indy claimed that if Beethoven's works were destroyed, they could be all reconstructed from memory by George Enescu. Alfred Cortot, one of the greatest pianists of all time, once said that Enescu, though primarily a violinist, had better piano technique than his own. In the meantime, he took an active part in building a classical concert life in his native Romania. He formed a Philharmonic Orchestra in the town of Iasi, and a Composers' Society. He wrote his most famous works, the two ‘Romanian Rhapsodies’, Op. 11, for the Philharmonic. He also worked closely with the Conservatories in Bucharest and Iasi. In 1912 he funded a ‘George Enescu Prize’ in composition, and played the world premieres of the winning works. He made his first appearances in the United States in 1923, as violinist and guest conductor with the Philadelphia Orchestra. The brilliant young American prodigy, Yehudi Menuhin, became his most famous pupil. Others were Gitlis, Grumiaux, and Ferras. Through the 1930s he continued work as a violinist, conductor, teacher, musicologist, and organizer, while as a composer he toiled on his powerful opera OEDIPUS. 1936 he was one of the candidates considered to replace Arturo Toscanini as permanent conductor of the New York Philharmonic. "Kiril Petrovich Kondrashin was internationally the best-known conductor of the Soviet Union and also the most prominent one to emigrate from that country. He was known for vigorous and solid performances of a wide repertory, particularly the Russian masters. He entered the Moscow Conservatory in 1934, where he studied conducting with Boris Khaikin. He graduated in 1936, but by then had obtained a job as assistant conductor at the Nemirovich-Danchenko Music Theater in 1934, debuting with the operetta LES CLOCHES DE CORNEVILLE by Planquette. In 1936 he was conductor at the Maly Opera Theater in Leningrad, retaining that post until 1943. Along with other artists who were deemed important to the war effort, he was evacuated from besieged Leningrad after the German invasion of Russia. In 1943, he became a member of the conducting staff of the Moscow Bolshoi Theater, which was also in a wartime home outside the capital. He remained with the Bolshoi until 1956, making marked improvement in his interpretation. Meanwhile, a demand was building for him as a concert conductor. He received Stalin Prizes in 1948 and 1949. When he left the Bolshoi, it was with the intention of centering his career on the podium rather than in the pit. His fame grew greatly in 1958, when he led the orchestra in the prize-winning appearances of American pianist Van Cliburn at the Tchaikovsky International Competition. Cliburn charmed both his home country and his Russian hosts, and the resulting LP record of the Tchaikovsky First Piano Concerto, conducted by Kondrashin, was a long-time best seller. This led to his American and British debuts, making Kondrashin the first Soviet conductor to appear in the U.S. In 1960 he was named artistic director of the Moscow Philharmonic, and as such participated in another piano concerto blockbuster recording with a U.S. piano star, the great Prokofiev Third Concerto recording for Mercury with Byron Janis, still considered by many the greatest interpretation of that brilliant work on disc. Kondrashin's performances were bright and dramatic, tending to programmatic interpretations that commentators saw as the legacy of his theater career. He was the U.S.S.R.'s finest interpreter of Mahler, leading all the symphonies with unusual restraint and with the expressive and dramatic qualities of the music seemingly enhanced by understatement.